photograph by James Jarché, Daily Herald Archive. 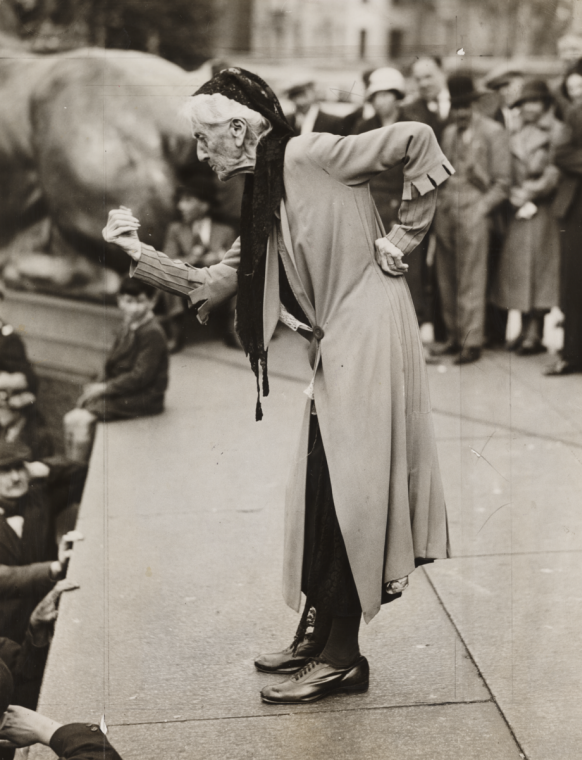 Charlotte Despard (1844-1939) was a remarkable – even amazing – woman. Don’t just take my word for it. Listen to Mahatma Gandhi (1869-1948). Visiting London in 1909, he met all the leading suffragettes. The one who impressed him most was Charlotte Despard. She is ‘a wonderful person’, he recorded. ‘I had long talks with her and admire her greatly’.1 They both affirmed their faith in the non-violent strategy of political protest by civil disobedience. Despard called it ‘spiritual resistance’. What’s more, non-violent protest has become one of the twentieth-century’s greatest contributions to potent mass campaigning – without resorting to counter-productive violence. Associated with this strategy, the names of Henry Thoreau, Mahatma Gandhi and Martin Luther King, all controversial in their day, have become canonised.2 Yet Charlotte Despard, who was also controversial in her day, has been substantially dropped from the historical record. And one major reason for her loss helps to explain her disappearance from mainstream historical memory. Despard was a pacifist, who opposed the First World War and campaigned against conscription. Many patriotic voters in Battersea disagreed with this stance. In the immediate aftermath of war, emotions of relief and pride triumphed. Some months later, Labour swept the board in the 1919 Battersea municipal elections; but without Charlotte Despard on the slate. Leading pacifists are not necessarily all neglected by history.4 But the really key point was that Charlotte Despard campaigned for many varied causes during her long life and, at every stage, weakened her links with previous supporters. Her radical trajectory made complete sense to her. She sought to befriend lame dogs and to champion outsiders. Yet as an independent spirit – and seemingly a psychological loner – she walked her own pathway. Despard was by birth an upper crust lady of impeccable Anglo-Irish ancestry, with high-ranking military connections. For 40 years, she lived quietly, achieving a happy marriage and a career as a minor novelist. Yet, after being widowed at the age of 40, she had an extraordinary mid- and late-life flowering. She moved to Battersea’s Nine Elms, living among the poorest of the poor. And she then became a life-long radical campaigner. By the end of her career, she was penniless, having given all her funds to her chosen causes. However, the energetic Charlotte Despard did not confine her efforts solely to the cause of the female suffrage. Her life in Battersea radicalised her politically and she became a socialist. She was not good at detailed committee work. Her forte was activism. Indefatigably, she organised a local welfare system. She funded health centres for mothers and babies, exchange points for cots and equipment, youth clubs, and halls for local meetings. And the front room of her small premises in Nine Elms was made available to the public as a free reading room, stocked with books and newspapers. It was a one-woman exercise in practical philanthropy. What’s more, her 1918 election manifesto called for a minimum wage – something not achieved until 1998. 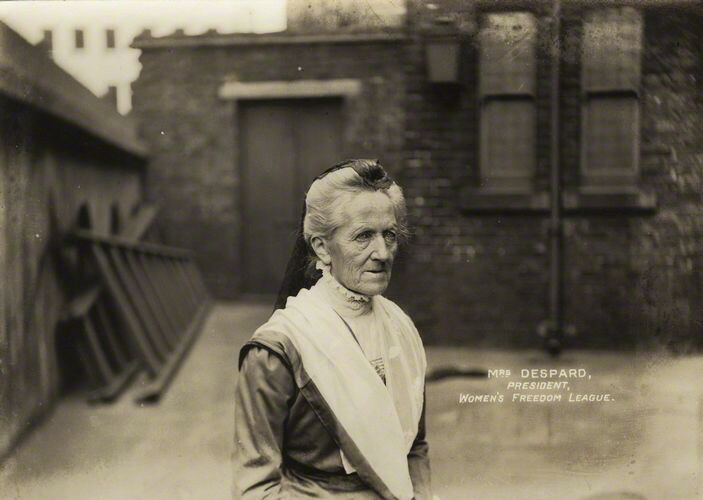 Among the Battersea workers, the tall, wiry, and invariably dignified Charlotte Despard cut an impressive figure. A lifelong vegetarian, she was always active and energetic. And she believed in the symbolic importance of dress. Thus she habitually wore sandals (or boots in winter) under long, flowing robes, a lace shawl, and a mantilla-like head-dress. The result was a timeless style, unconcerned with passing fashions. She looked like a secular sister of mercy. Fig.2 Charlotte Despard in the poor tenements of Battersea’s Nine Elms, where she lived from 1890 to the early 1920s, instituting and funding local welfare services. Her visitors commented adversely on the notorious ‘Battersea smell’ of combined industrial effluent and smoke from innumerable coalfires; but Despard reportedly took no notice. 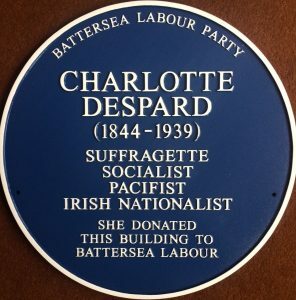 For a number of years, Despard worked closely with the newly founded Battersea Labour Party (1908- ), strengthening its global connections. She attended various international congresses; and she backed the Indian communist Shapurji Saklatvala as the Labour-endorsed candidate in Battersea North at the general election in 1922. (He won, receiving over 11,000 votes). Yet, as already noted, the Battersea electorate in 1918 had rebuffed her own campaign. Then at a relatively loose end, Despard moved to Dublin in the early 1920s. She had already rejected her Irish Ascendancy background by converting to Catholicism. There she actively embraced the cause of Irish nationalism and republicanism. She became a close supporter of Maud Gonne, the charismatic exponent of Irish cultural and political independence. By the later 1920s, however, Despard was unhappy with the conservatism of Irish politics. In 1927 she was classed as a dangerous subversive by the Free State, for opposing the Anglo-Irish Treaty settlement. She eventually moved to Belfast and changed tack politically to endorse Soviet communism. She toured Russia and became secretary of the British Friends of the Soviet Union (FSU), which was affiliated to the International Organisation of the same name. These factors combined together to isolate Despard and to push her, after her death, into historical limbo. There are very few public monuments or memorials to her indomitable career. In north London, a pleasant pub on the Archway Road is named after her, on land which was owned by her husband Colonel Despard. On Battersea’s Doddington Estate, there is an avenue named after her, commemorating her welfare work in the area. And now there is the blue plaque outside the headquarters of Battersea Labour at 177 Lavender Hill, SW11. These memorials are fine but hardly enough. 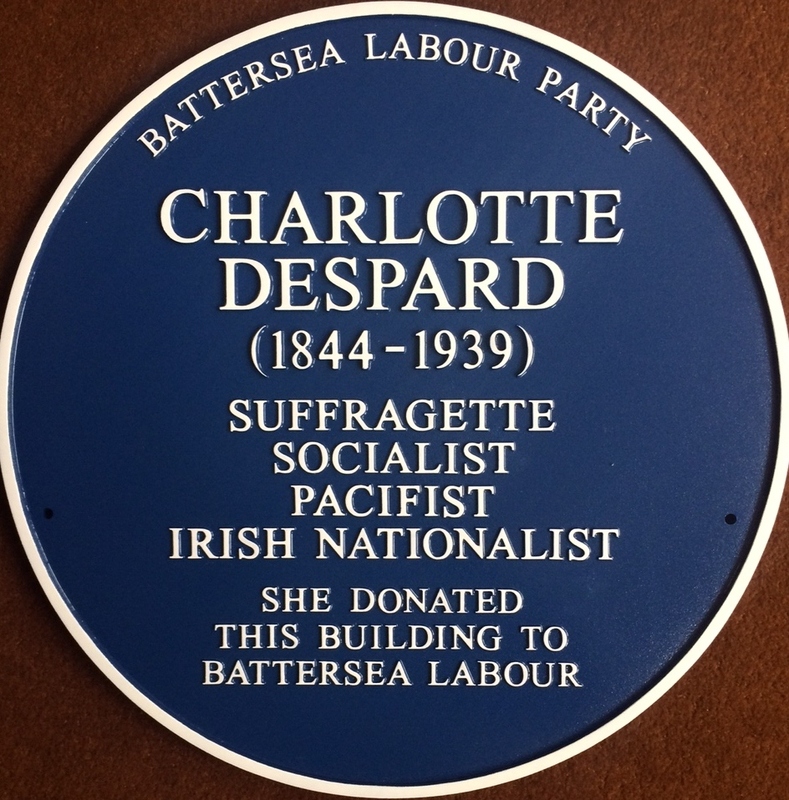 Fig.3 Blue plaque to Charlotte Despard, outside 177 Lavender Hill, London SW11 5TE: installed 14 December 2018, on the precise centenary of her standing for parliament in 1918, as one of only 16 women pioneers to do so. Why should she be remembered? The answer is not that everyone would have agreed (then or later) with all of Charlotte Despard’s political calls. As this account has shown, she was always controversial and, on Russia, self-deceived into thinking it much more of a workers’ paradise than it was (as were many though not all left-leaning intellectuals in the West). Nonetheless, she is a remarkable figure in the history of public feminism. She not only had views but she campaigned for them, using her combination of practical on-the-ground organisation, her call for symbolic non-violent protest and ‘spiritual resistance’, and her public oratory. And she did so for nigh on 50 years into her very advanced years. 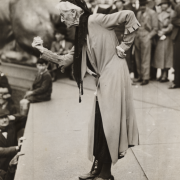 Appropriately for a radical campaigner, Charlotte Despard’s last major public appearance was on 12 June 1933, when she spoke passionately at a mass anti-fascist rally in Trafalgar Square. At that time, she was aged 89. It was still unusual then for women to speak out boldly in public. They often faced jeers and taunts for doing so. But the photographs of her public appearances show her as unflinching, even when she was the only woman amidst crowds of men. Above all, for the feminist feat of speaking at the mass anti-fascist rally at the age of 89, there is a good case for placing a statue on Trafalgar Square’s vacant fourth plinth, showing Despard in full oratorical flow. After all, she really was there. And, if not on that particular spot, then somewhere relevant in Battersea. Charlotte Despard, born 175 years ago and campaigning up until the start of the Second World War, was a remarkable phenomenon. Her civic and feminist commitment deserves public commemoration – and in a symbolic style worthy of the woman. (L) dated 1910 when she was 66, and (R) dated 1933 when she was aged 89. ‘Mrs Despard – she always gets a crowd’. 1 Quoted in M. Mulvihill, Charlotte Despard: A Biography (1989), p. 86. See also A. Linklater, An Unhusbanded Life: Charlotte Despard, Suffragette, Socialist and Sinn Feiner (1980); and, for Battersea context, P.J. Corfield in Battersea Matters (Autumn 2016), p. 11; and PJC with Mike Marchant, DVD: Red Battersea: One Hundred Years of Labour, 1908-2008 (2008). 2 A. Roberts and T. Garton Ash (eds), Civil Resistance and Power Politics: The Experience of Non-Violent Action from Gandhi to the Present (Oxford, 2009); R.L. Holmes and B.L. Gan (eds), Nonviolence in Theory and Practice (Long Grove, Illinois, 2012). 3 1918 general election result for North Battersea: Richard Morris, Liberal (11,231 = 66.6% of all voting); Charlotte Despard, Labour (5,634 = 33.4%). Turnout = 43.7%. 4 P. Brock and N. Young, Pacifism in the Twentieth Century (New York, 1999). 5 With thanks to research undertaken by Annette Aseriau. 6 Mulvihill, Charlotte Despard, p. 180. 7 Ibid., pp. 46-7, 78-9. 8 Account by Christopher St John, in Mulvihill, Charlotte Despard, p. 77.
https://www.penelopejcorfield.com/wp-content/uploads/2018/12/2019-01-No15-Despard-in-Trafalgar-Square-1933.png 760 582 Penelope J Corfield https://www.penelopejcorfield.com/wp-content/uploads/2014/08/Penelope-J-Corfield.png Penelope J Corfield2019-01-01 09:00:002018-12-29 23:42:19MONTHLY BLOG 97, WHY IS THE REMARKABLE CHARLOTTE DESPARD NOT BETTER KNOWN? What do today’s academics spend their time doing? Next to marking essays and planning research applications, one of the most common tasks is writing personal references for past and present students (and sometimes for colleagues too). Happily, such evaluations are not presented anonymously.1 Yet that makes writing them all the more testing. The aim is to do full justice to the person under consideration, whilst playing fair with the organisation which is receiving the recommendation. Sometimes those aims can be in conflict. Should you recommend someone for a job for which they are not suitable, even if the candidate pleads with you to do so? The answer must be: No. Actually I can remember one example, some years ago, when an excellent postgraduate wanted to apply for a new post which demanded skills in quantitative economic history. Since she did not have those special skills, I hesitated. She implored me to write on her behalf – it was in an era when new academic posts were rare – and, reluctantly, I did so. However, I told her that my reference would explain that she did not have the required skills, although she would be a great appointment if the University in question decided to waive those preconditions. (It was theoretically possible). In the event, she did not get the job. For the future, I resolved not to waste everyone’s time by writing references in unsuitable cases. A polite refusal does sometimes upset applicants. But it’s best to be frank from the start – and certainly better than writing a thumbs-down reference. (I decline to act if I can’t find anything positive to say). Truth with tact is the motto. 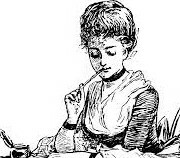 When writing, it’s good to dwell on the candidate’s best qualities, in terms of past attainments and future potential. But it’s seriously unwise to go over the top. Referees who praise everyone unreservedly to the skies quickly lose credibility. What is written should strive to match the best qualities of the person under discussion. Candidates often get called for interview; and it undoubtedly helps interview panels if the candidates broadly resemble their references. (It is ok, by the way, to warn panels in advance in cases of exceptionally nervous interviewees, who may need help to ‘unfreeze’). Equally, when writing in support of candidates, it’s seriously wrong to go not over but under the top. There used to be an old-fashioned style of wry deprecation. It had a certain period charm. Yet in recent decades there’s been a definite inflation of rhetoric. Wry self-deprecation is still ok, when used in front of those who understand the English art of meiosis or ironic understatement. But deprecatory assessments, or even deprecatory asides, about other people are distinctly unhelpful in today’s competitive climate. Even one passing put-down can harm a candidate, when competing against rivals who are described in completely flattering terms. Again, I remember a case at my University, where the venerable referee – a punctilious scholar of the old school – was warm but could not resist adding a critical aside. The candidate in question was much the best. Yet she lost out in the final choice, on the grounds that even her friendly referee had doubts about her. Really annoying. She went on to have a distinguished career – but elsewhere. We lost a great colleague. Some months later I had a chance to talk with the venerable referee, who expressed bafflement that his candidate did not get the job. He was blithely unaware that he had, unintentionally, stabbed her in the back. It was a complete conflict between different generational styles of writing references. Later, I advised the candidate not to press me for further details (since these things are all confidential) but simply to change her referees, which she did. Such stylistic inter-generational contrasts still continue to an extent, although they take a somewhat different form these days. Either way, the moral is that balanced assessments of candidates are fine; shafts of sardonic humour or any form of deprecatory remarks aimed at an absent candidate are not. Then there’s the question of different international cultures of writing references. Academics in some countries prefer a lyrical rhetoric of flowery but imprecise praise which can be very hard to interpret. (Is it secret humour?) By contrast, other references from a different stylistic culture can be very terse and factual, saying little beyond the public record. (Do they reflect secret boredom or indifference?) My advice in all cases is for candidates to choose referees from their own linguistic/academic/cultural traditions, so that recipients will know how to decode the references. Or, in the case of international applications, then to choose a good range of referees from different countries, hoping to balance the contrasting styles. So there we are. Refereeing is an art, not a precise science. Truth with tact. Every reference takes thought and time, trying to capture the special qualities of each individual candidate. But, a final thought: there’s always one exception to the rule. The hapless Philip Swallow in David Lodge’s brilliant campus novel Changing Places (1975) encounters this problem, in the form of the former student demanding references – who never goes away. The requests pile up relentlessly. ‘Sometimes he [the former student] aimed absurdly high, sometimes grotesquely low. … If [he] was appointed to any of these posts, he evidently failed to hold them for very long, for the stream of enquiries never ran dry’. Eventually, Swallow realises that he is facing a lifetime commitment. He therefore generates an ‘unblushing all-purpose panegyric’, which is kept on permanent file in the Departmental Office.2 It’s just what every referee secretly craves, for use in emergencies. Just make sure that there are no flowery passages, no hyperbole, no ambiguities, no accidental put-downs, no coded messages, no brusque indifference, no sardonic asides, no joking. Writing personal references, on the record, is utterly serious and time-consuming business. Thank goodness for deadlines. 1 For my comments on writing anonymous assessments, see BLOG/80 (Aug. 2017) and on receiving anonymous assessments of my own work, see BLOG/81 (Sept. 2017). 2 David Lodge, Changing Places: A Tale of Two Campuses (1975), pp. 28-9.